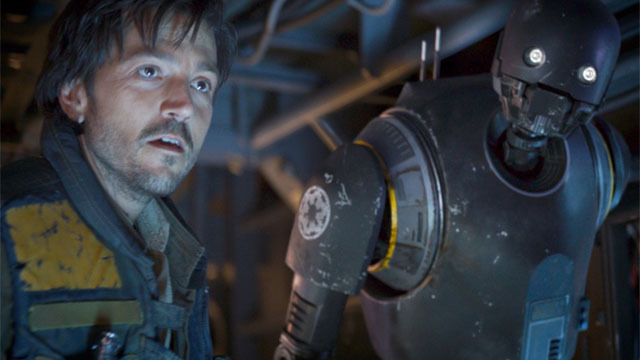 Although Cassian Andor and K-2SO’s story ended with Rogue One, Disney+ is giving the duo a new lease on life. During the Disney Investor Day 2019 presentation, Lucasfilm President Kathleen Kennedy announced that Alan Tudyk will reprise his role as K-2SO on the Cassian Andor series. As previously revealed, Diego Luna will reprise his role as Cassian. The series will be a prequel to Rogue One: A Star Wars Story. Via StarWars.com, it was also confirmed that Stephen Schiff (The Americans) is the showrunner and executive producer of Cassian Andor. The announcement describes the show as a “rousing spy thriller will explore tales filled with espionage and daring missions to restore hope to a galaxy in the grip of a ruthless Empire.” Production will begin later this year. However, it’s going to be a long wait for fans. The show won’t premiere until 2021. There is some good news for Star Wars fans. The Mandalorian will launch with Disney+ on November 12. It will also take place a few years after Return of the Jedi, while following the exploits of the titular Mandalorian gunslinger. Director Jon Favreau is the driving force behind The Mandalorian, which stars Pedro Pascal. Gina Carano co-stars in the series alongside Nick Nolte, Giancarlo Esposito, Emily Swallow, Carl Weathers, Omid Abtahi, and Werner Herzog. Are you excited about Alan Tudyk’s return to the Star Wars universe? Let us know in the comment section below!